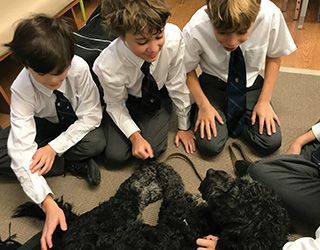 Boys in the Junior School enjoyed some animal love, when some dogs visited their classrooms during Mental Health Awareness Week. The boys had a chance to pet and cuddle their furry friends. The students found it an extremely beneficial way to start the day and most agreed that they wanted dogs in the classroom on a more regular basis. “It was so much fun - we should have dog therapy as often as we have math,” said Jake Andersen, Grade 3. Max Campbell, Grade 5 loved spending time with a really cute dog. “It calms you down if you had a bad start to the day,” he said.